March 25, 2016 By This post may contain affiliate links. 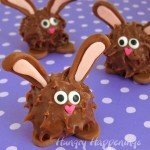 It’s not too late to make these quick and easy 2 ingredient Chocolate Caramel Fudge Easter Bunnies with white candy tails to put into your Easter baskets. 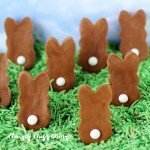 In about 30 minutes you can have a whole bunch of these lusciously creamy chocolate bunnies made for the holiday. 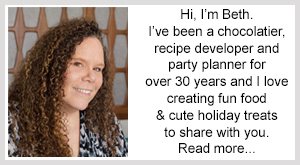 Easter is upon us and I sold all the Easter treats that I’ve made, so I am scrambling to get a few quick and easy treats made to put in our Easter baskets. 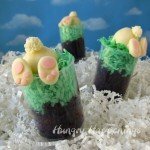 A few weeks ago, I made some sweet Chocolate Caramel Fudge Filled Hatching Chicks, and the filling was so easy to make and so good, that I thought it would be the perfect last minute recipe to use to make these chocolate Easter bunnies. The fudge is made using caramel flavored sweetened condensed milk and pure milk chocolate. That’s it. Just 2 ingredients. And, it makes the most decadently rich chocolate caramel fudge. I made the fudge then poured it into a silicone bunny mold. 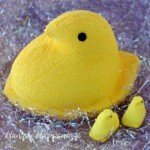 It’s actually a Peeps mold, and it made perfectly sized bunnies. The mold has eyes and a nose imprinted onto one side, but I decided to use the backsides of the bunnies instead and added white Sixlets tails. I realize Easter is in two days, and you may not have one of these molds on hand. 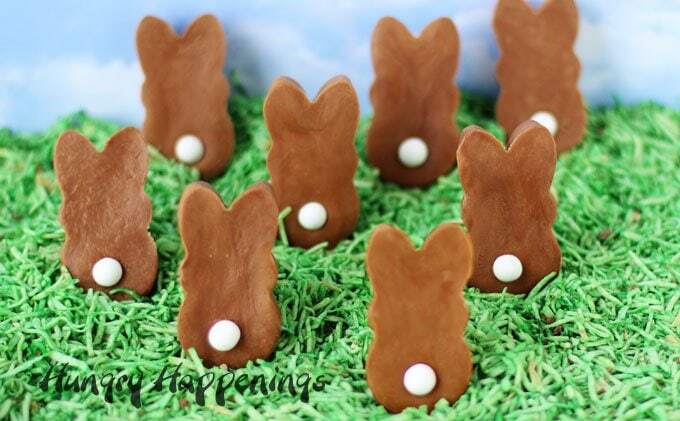 If that is the case, you could make these bunnies by pouring the fudge into a pan, allowing it to firm up, then cutting it with a bunny shaped cookie cutter. You’d end up with scraps of fudge that you could roll into balls and press in the cutter or simply enjoy them as a snack. Use your favorite milk chocolate to make the fudge. Chop it finely, place it in a microwave safe bowl, heat it for two 30 second bursts on high power, stirring after each. Then pour in a can of Eagle Brand Caramel Flavored Sweetened Condensed Milk. Stir it together, then heat on high power for 20 seconds. Let the bowl sit in the microwave for 3 minutes. Then remove and stir. If the chocolate is not all melted, heat for 10 second increments, stirring after each, until melted. If the fudge gets too hot, it will get greasy. If this happens, follow my instructions for fixing greasy modeling chocolate on my chocolate making tips page. It works the same. I love how the caramel flavored sweetened condensed milk adds a lovely caramel flavor to the fudge. 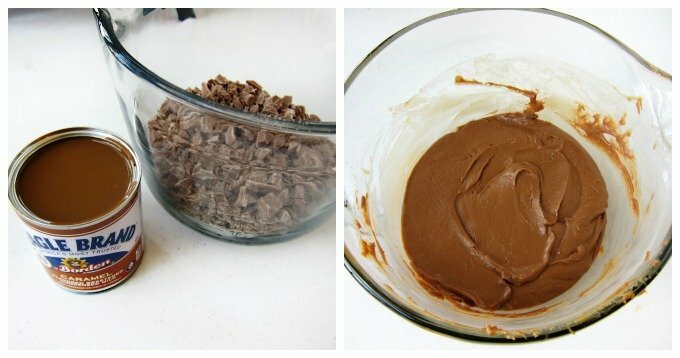 If you can’t find it, you can use regular sweetened condensed milk to make a plain milk chocolate fudge. Or you can use Dulce de Leche which is caramelized sweetened condensed milk. It will give you the nice caramel flavor, but it is really thick, so you’ll need to reduce the amount of milk chocolate to 14 ounces. 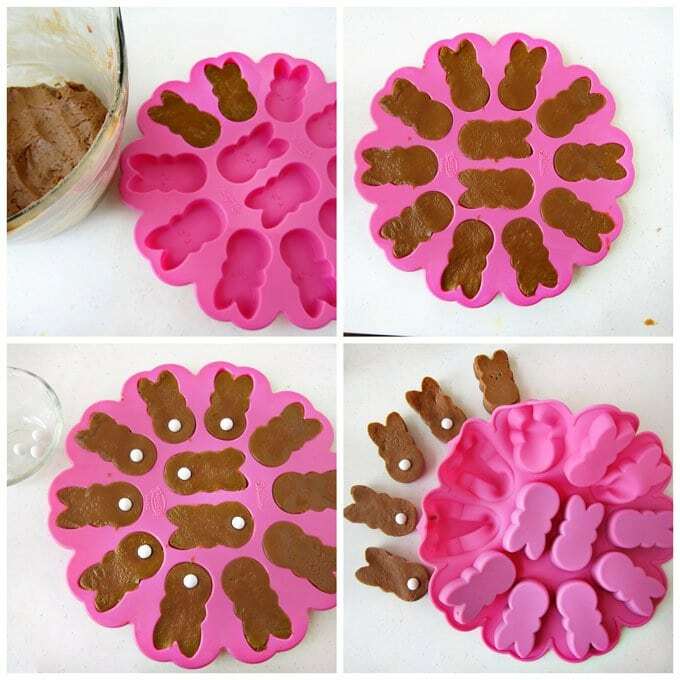 Spoon the fudge into bunny shaped silicone molds. Press the fudge down to compact it into the mold. Press one white Sixlet into the chocolate bunny for the tail. Pop the in the freezer for 15 minutes. Remove and press the backside of the mold and the bunnies will pop right out. I made 16 chocolate bunnies out of one batch of fudge, but only had one mold with 12 cavities. So I had to wait for the first batch to be done before making the next batch. The fudge had firmed up at this point, so I had to scoop it out, roll it into balls, then press it into the mold. To my surprise, these bunnies were smoother and prettier than the first batch. So, if you aren’t in a hurry, let the fudge rest for about 30 minutes, then scoop it and roll it into balls, then press it into the molds before attaching the tails. If you look at the picture above, you can see the difference in the bunnies. The bunnies in the very front are really smooth. The one to the far left is a bit lumpy. I’m probably the only person who would notice the difference, but I liked the smooth ones better. 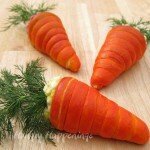 Once your bunnies are made, you can package them in small cellophane bags and tie with a bow to put into your baskets, or you can nestle them in some Easter grass or green colored coconut and display them on your Easter table. I propped my bunnies up against some modeling chocolate. That is how they are standing upright for the picture. If you want to display them this way, you could just make 12 fudge bunnies and roll the rest of the fudge into balls then use the balls to prop up your chocolate fudge bunnies. 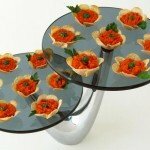 Any way you make them I hope they are a big hit. 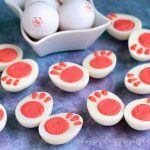 Easy 2 ingredient chocolate caramel fudge shaped like Easter bunnies have cute white candy tails. Heat it for two 30 second bursts on high power, stirring after each. Pour in the caramel flavored sweetened condensed milk. Stir, then heat on high power for 20 seconds. Let the bowl sit in the microwave for 3 minutes. If the chocolate is not all melted, heat for 10 second increments, stirring after each, until melted. Spoon into silicone bunny mold. Press on the fudge to compact it. Press one white Sixlet tail on each bunny. Freeze mold for 15 minutes. Remove and press on backside of mold, to remove the bunnies. Repeat, if needed, to make more bunnies. Two Ingredients?? 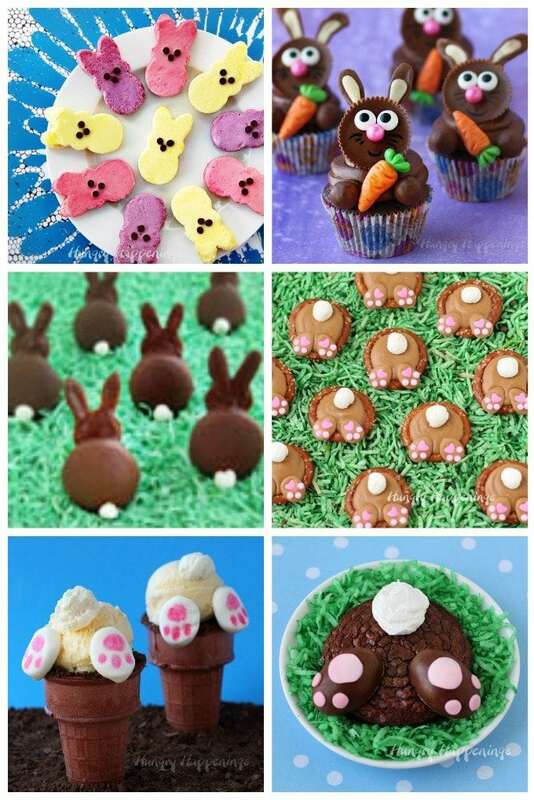 Wow, I may not get them made for Easter, but the possibilities are endless. Another fantastic use for all my silicone molds! I know it’s a little late to make them this year, but the recipe could be used for so many things. I do love my silicone molds! Happy Easter, Kim. Yay..I have the chocolate and the condensed caramel!! 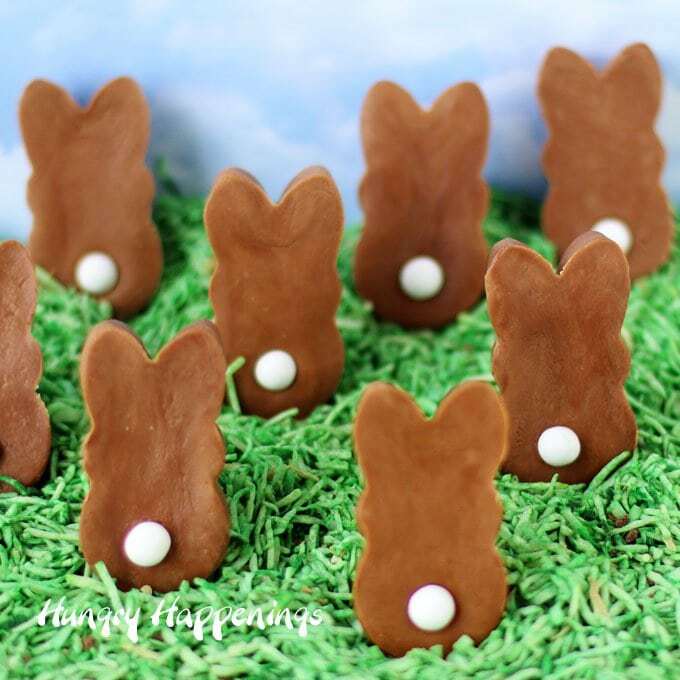 Your recipe sounds delicious and your bunnies just look so hoppity-cute! I realize Easter is now over, but I know you’ll come up with another creative way to make this chocolate caramel fudge. Enjoy!